As the world awaits the outcome of the US Presidential and Congressional elections, one important trend that has been largely overlooked during the period of election uncertainty is the return to profit growth of the US corporate sector. Over 85% of the companies in the S&P 500 index have already reported earnings for Q3 2016. Of those companies 71% have reported earnings above the mean estimate and 54% have reported sales above the mean estimate, based on FactSet data. For Q3 2016 the blended (combines actual results for companies that have reported and estimated results for companies yet to report) earnings growth rate for the S&P 500 is 2.7%. That may not seem like much but if the S&P 500 index does record positive growth in earnings for the quarter, it will mark the first time the index has seen year-on-year growth in earnings since Q1 2015. That is a significant improvement on what the market was expecting at the start of earnings season. On 30 September the consensus had expected an earnings decline of -2.2% for Q3 2016. All eleven sectors have higher growth rates today (compared to 30 September) due to upside earnings surprises, led by the Real Estate sector. Eight sectors are reporting or have reported year-on-year earnings growth, led by the Real Estate and Utilities sectors. Three sectors are reporting or have reported a year-on-year decline in earnings, led by the Energy sector (see the chart). The return to positive year-on-year growth in US earnings on the back of profit upgrades is an important milestone for equity markets. In terms of what the market expects for earnings growth going forward, the consensus forecasts for calendar year 2017 can be seen in the chart below. 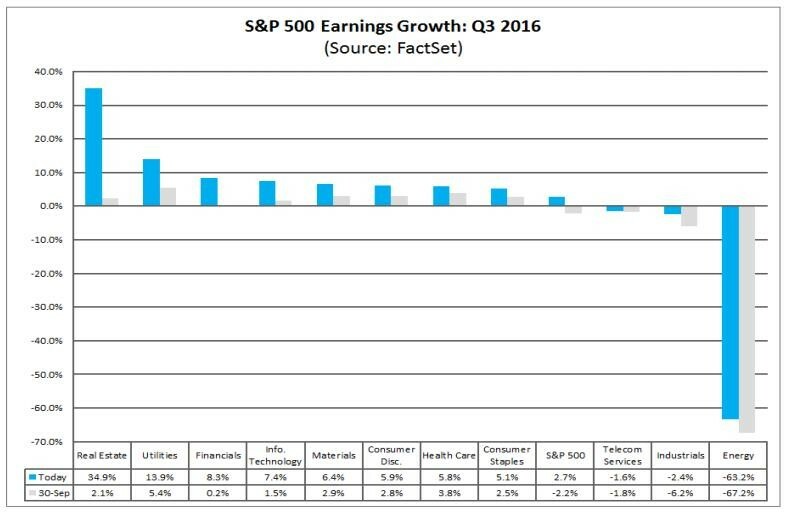 For the S&P 500 index as a whole the market expects 11.6% earnings growth in 2017. The strongest growth (off a low base) is expected to be in the Energy and Materials sectors. Importantly, they are the only two sectors that have higher earnings forecasts for 2017 now than they did back on 30 September. In other words, they are the sectors with the strongest earnings upgrade momentum. However, the Information Technology sector is also still expected to report double-digit earnings growth in 2017. As part of normal sector rotation, the Real Estate sector, which reported the most earnings growth in Q3 2016, is the only sector expected to report negative earnings growth in 2017. A pro-cyclical bias is being indicated based on what the consensus expects for earnings growth in 2017. For now the market is preoccupied with US politics, which will determine what happens in the very short term. Just as important as who becomes the next US President will be whether the Democrats regain control of the Senate, which would then act as a counterfoil against the Republican-controlled House. Once the election uncertainty has ended the market will start to refocus on the real fundamentals of earnings, interest rates and valuation. Until now earnings growth had been the missing link, needed more than ever to offset the effects of rising bond yields and high equity valuation. With US earnings now back in the black there is at least something to feel more positive about. Volatility and political uncertainty today has concealed the Dow Transport Index which last week broke to the upside while the rest of the market was going down. The Transport Index is one of the most reliable leading indicators of the Dow Jones index. Unfortunately, political volatility will continue to rule until next Monday. The Transport Index needs to hold its gain for another week when the talking heads will run out of steam.